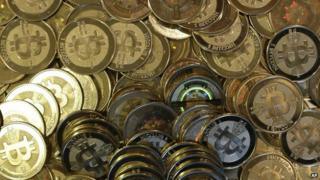 Plans for a gold-backed version of the digital currency Bitcoin in the Channel Island of Alderney have been shelved. Robert McDowall, the chairman of the Alderney Finance Committee, said it was one of a number of ideas for diversifying the island economy. He was working with the Royal Mint to create the coin that would be gold and tied to the value of a single bitcoin. Royal Mint Chief Executive Adam Lawrence said they did not back the project but declined to explain why. Mr McDowall said he still planned to go ahead with the gold backed coin, but with another jurisdiction like the Isle of Man or Jersey and in a private capacity. He said the coins would have been commemorative and could have been a "good stream of revenue" for the island. Alderney and the Royal Mint would have made money from the royalties made on their sale. The coins would contain a set amount of gold, so they could be melted down and sold if the Bitcoin currency collapsed, making investing in Bitcoins potentially safer. "The funny thing is that if we had done it through Alderney I would not have profited personally [due to my role], now I am able to make money on it myself." Mr McDowall said he had come up against opposition throughout the project from the States of Guernsey, which is responsible for regulating Alderney. He said: "Guernsey have claimed it will damage their reputation if we go ahead with this, they are backwards thinking and need to move with the times. This is the future." Deputy Kevin Stewart, Guernsey's Commerce and Employment Minister, rejected the claims describing them as "ill judged" and potentially damaging to Alderney's finance sector. He said while the development of virtual currencies was a "real opportunity" for the financial services sector it came with "very well publicised risks". Fiona Le Poidevin, Guernsey Finance's chief executive, said the lack of regulation was one area of concern. She said: "Bitcoin has been associated with some scandal and its very nature means there are risks in terms of the potential for fraud and money laundering."